Bear in mind that in pre-modern times there were, at least, a high road and a low road linking place with place. The high road stuck to high ground, and it crossed streams high in their course, and found use in times of high water. Morgan Creek descends from west-central Orange County southeast to a junction with New Hope Creek, a major Cape Fear head-water. It sort of cradles or embraces Carrboro and Chapel Hill, North Carolina by bending round their western edge and sliding along their south side before reach New Hope Creek. It powered some the area's earliest grist mills, and it is one of three barrier streams channeling east-west trade routes through the area. In low water it may have been a preferred route as the ford at Morgan Creek is on a decent flood plain over which flood waters can spread without rising too much. The topo map shows that the route in question passed over the very northern-most head waters of the creek. A 17th or 18th century traveler en route from Wood's Fort on the Appomatox River in Virginia to, say, the Catawba peoples around their river, south of Charlotte, NC, in a dry season, might have passed over Morgan Creek to get to a low road ford over the Haw River at what became (19th Century) Cedar Cliffs. 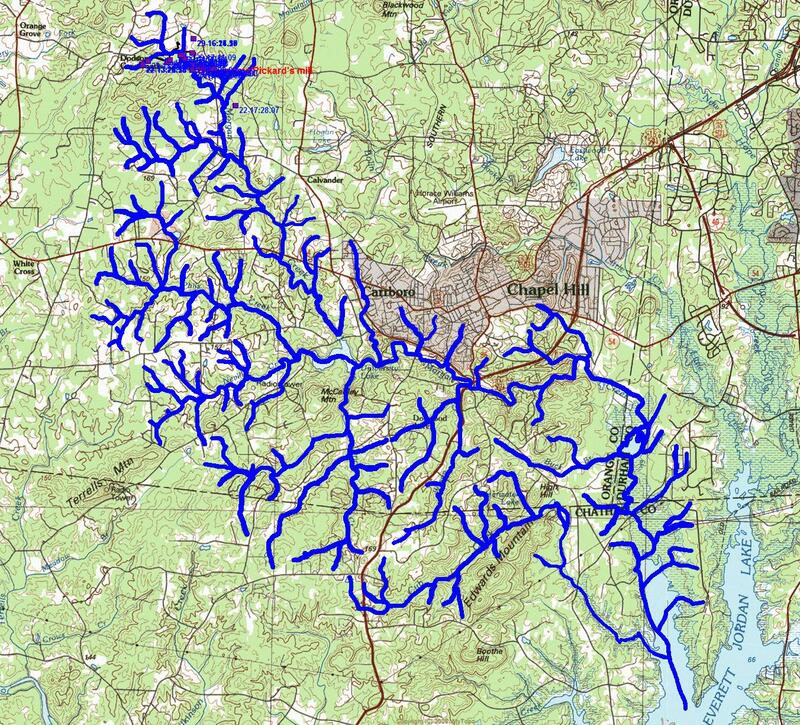 Between the Neuse River and the Haw River there are three barrier streams that traveler had to negotiate; New Hope Creek, west of Durham, Morgan Creek, west of Chapel Hill, and Cane Creek, a Haw River feeder further west, near the Alamance County Line. In spate, any one of these streams could stop a traveler. The road from Fish Dam crossed one of the low fords over New Hope Creek, the first fordable point after the New Hope breaks out of its head-water hills. The ford is on the upstream edge of a massive, eight mile long corn bottom that regularly flooded. When flooded it was probably all but impassable and traffic would have moved upstream to a shallower, narrower stream bottom near where Mount Sinai Road crosses the creek today. But in dry weather this lower passage over the New Hope would have been attractive for a number of reasons. Alongside this low ford over New Hope Creek, in the 17th and early 18th century were two Occaneechi villages renown enough to have appeared on some of the earliest maps of the southeast, renditions of "Tuscarora Jack" Barnwell's map of the backcountry ca 1715. 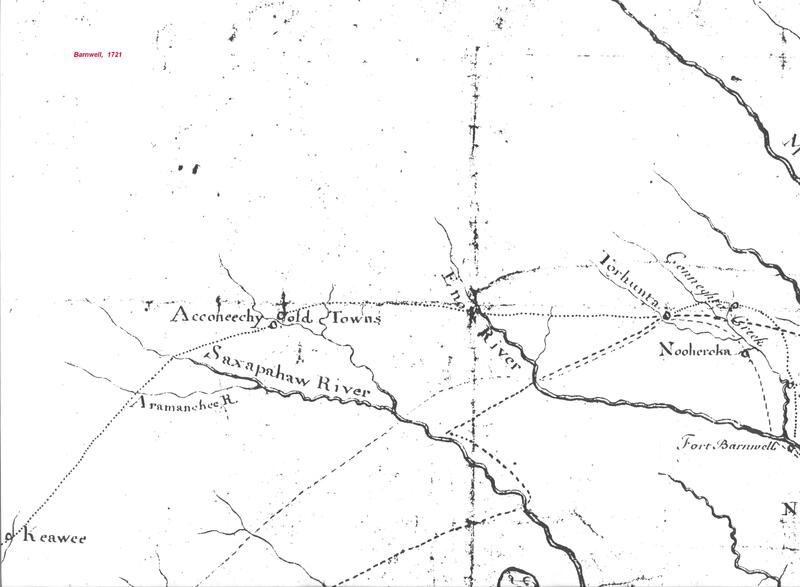 They were trade towns, and they were probably the towns called "Adshusheer" by John Lawson (who passed through the area in 1701). It was a wonderfully important choke point attracting traffic from a half dozen major backcountry trade lanes. After crossing New Hope Creek, west and southwest bound traffic made tracks for fords over the Haw River, and the best of these low water, low road fords were Saxapahaw and a ford more properly oriented for traffic to the southwest, upstream about two miles, that came to be called "Cedar Cliffs." The way to this ford had to pass several obstacles to minimize energy expenditures. It first slipped between the watersheds for Old Field Creek and Bolin Creek, passing south of the former and north of the latter. The next obstacle would have been "Meadow Flats", an area of upland marsh almost always damp and soft. The trail clung to the south end of the flats and then threaded through a region of increasingly challenging hills culminating in Pickards, Crawford, and Thompson mountains (see map above). After passing Meadow Flats, the trail approached Morgan Creek. It could bypass the creek altogether but the more direct route, and the easiest route in all but the most extreme weather. The crossing was at the first falls on Morgan Creek, and this water fall eventually, probably in the 18th century, powered Pickard Mill. The pond behind the mill dam may have been as much as 3/4 of a mile long and may account for the great northern loop of Dairyland Road. The Lower Trading Path passed south of Morgan Creek and recrossed the creek just above the upstream end of the mill pond. Fords and mills frequently coincide as they required the same geophysical circumstances; a shallow place downstream from but nearby a fall. A fall implies exposed bedrock which ensures a firm substrate for a dam as well as a ford. Pickard Mill dam, in fact, crosses Morgan Greek about fifty to seventy-five yards from likely ford locations. All approach roads are now silted over. Morgan Creek, at Pickard Mill has one more desirable attribute too; below the fall the bottom flares wide, and a broad bottom of a feeder creek provide flats over which a flood can disperse and allow passage even in high water. For all these reasons and because it sat along the path of least resistance between New Hope Creek and Cane Creek, Mark Morgan saw the ford and the mill followed. M Surprised to See the quality of information on this Site.There are a lots of Knowledgeable thought out resources here I Wish This crack of work as I future m came again here for know something new different topics.